Want to create a printed piece that's easy to handle and looks flawless? Check out the Thomas Nygard Gallery's latest catalog for some marketing inspiration. It can be difficult to design a concise catalog that is truly impactful, yet handy and ergonomic. You want the customer to experience the full appeal of the product while not feeling overwhelmed by bulky media. In this featured piece PFL created for the Thomas Nygard Gallery in Bozeman, Montana, all of the important details are included, but the smaller catalog format brings a fresh and unique feel to the piece. The result is an 8.5 X 5.5 catalog that maximizes space on each page - leaving the viewer with a piece that is convenient, portable, and stylish. Think you need a full sized catalog to be outstanding? Think again! The Thomas Nygard Gallery has grown since 1976 to offer arguably the finest collection of art in the American West. Working with a broad array of clients, from private collectors, to formal institutions - The Gallery provides a full range of offerings and services. Whether it be framing, restoration or sales; The Gallery is a leading authority of fine art in the West. The Thomas Nygard Gallery exudes a sense of elegance, which radiates throughout the catalog. However, as a working exhibition space, The Gallery also possesses an ability to showcase beauty and value in an extremely persuasive way. This "showcase" aspect is also an essential theme in the piece. 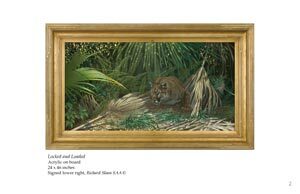 Fantastic print design focuses the viewer's eye on each painting - translating the showcase from gallery to catalog page. Product Images and Technical Specifications This piece provides the customer with information about one specific artist. The introduction summarizes the artist's life, and the following pages are filled with his paintings. The paintings are focused in the center of each page, surrounded by blank white - with nothing but the title and date in the margin. A brief history of The Thomas Nygard Gallery follows the images. 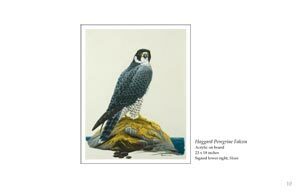 8.5 X 5.5 Catalog - The essence of this catalog is to showcase the rare and valuable kinds of artwork that The Nygard Gallery has to offer; exemplified by one single artist and his work. Instead of distracting the viewer with a typical catalog approach that attempts to preview nearly everything available; this catalog chooses to capture the customer with focus on one unique artist. Inside the front cover you find copyright information as well as basic contact info for The Gallery; hours, and appointment process. 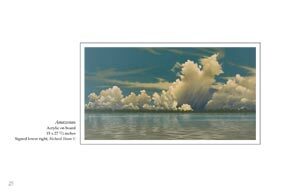 After a two page description of the artist and his career, you will find over 25 high quality images of his work. This is the true brilliance of the catalog's design. Each painting appears at the center of the page surrounded by blank white space. The eye is drawn toward the image and away from distraction, not unlike a gallery wall. The final page features a short description of the Nygard Gallery's history and expertise. If you are wondering how to produce a catalog that is both captivating and convenient, give us a call and let one of our designers show you some examples. This catalog does not attempt to push the viewer into a sales scenario. Instead, this piece is presented more like a book - an informational showcase about the artists almost without motive. The gallery information is presented only twice throughout the piece, and with the utmost subtlety. As the viewer learns about the history and unique skill of the artist, they come to realize almost subconsciously that the Nygard Galley is the kind of place that possesses rare fine-art masterpieces. Don't underestimate the power of strong clean design. 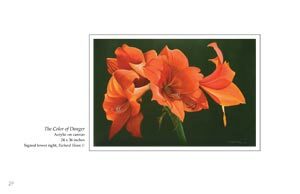 This full color catalog for the Thomas Nygard Gallery utilizes each page to its maximum potential, while maintaining a compact and convenient size. If you are interested in learning more about how you can utilize a small catalog for your next print project, give us a call at 800.930.2423. Some of the pages showing the nice artwork presentation.